This listing is for the 2' Double Aster (Ivy version) with a small frame. These hand-painted Barn Quilts are very rustic and will look awesome hanging outside on a house or garage or used as inside wall decor as well! Available in many patterns and colors, this particular pattern is Double Aster and available in 2' x 2' with a small frame. Pictured colors are Country Tan, Cinder, Ivy, River Bank, Warm White and Black. Please note that all of my quilts have a painted black border IN ADDITION to the black frame. It's my signature look. Also note that not all of the quilts pictured have the exact frame style for that listing. Refer to the last picture on the listing for a close-up of the frame and black border. 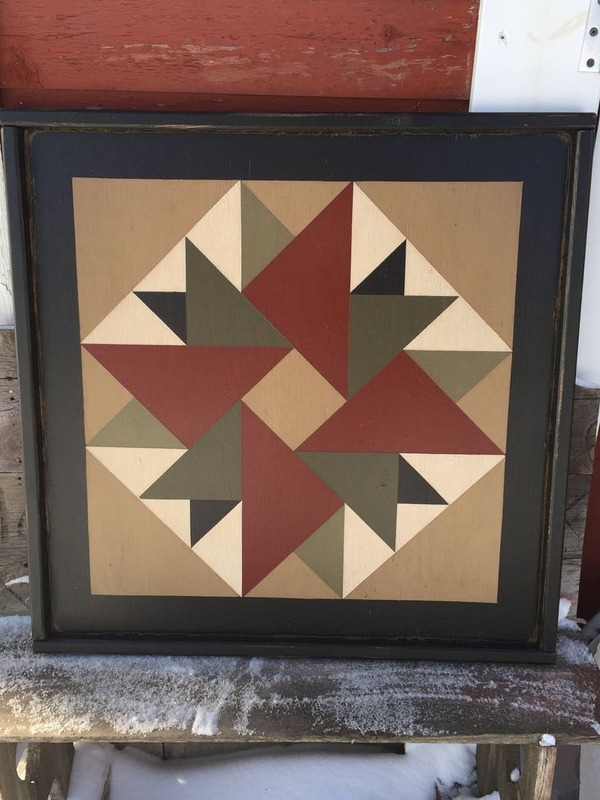 All of my barn quilts are hand-painted on 1/2" plywood, with a 3/4" pine edge frame in black, making the total finished size roughly 25 1/2" x 25 1/2". They are painted using premium exterior paints with primer and are highly distressed and stained for that worn, antiqued look. Please specify which photo and color combination in the comments section upon ordering. Unless specified by customer, quilts will be painted in the colors of the first preview photo. Many other color combinations are available upon special request. Two coats of Exterior Varathane are added for outdoor hanging. Thick framed versions and 3' versions are available under separate listings. Note that all of my Barn Quilts are "Made to Order". They are custom painted at the time of order, and may take 3-6 weeks for delivery. (Many times it will be finished sooner, however orders are processed and painted in the order they were received) Occasionally, I have quilts available for immediate shipment, and if so, it will be listed at the top of the listing. Unless otherwise specified by customer, new orders will be painted in the colors shown in first photo (if there is more than one photo). Please contact me if you are interested in other color choices. I have many to choose from, but note there is an additional charge for exact match colors. I love the Primitive style. It suits me. It shipped in a reasonable time and I was kept informed during the period of how soon it might ship. I am very happy with this shop and will most likely be shopping here again. I absolutely LOVE it! Quality workmanship-Thank you for the very speedy shipping! It’s exactly what it looks like on line. It did ship on time. I just love it !! Bought it for myself , couldn’t be happier! And Hollie is awesome. She checks in with you and give you choices on colors. I cannot wait to order another!